After two fantastic sell out shows, The Giggle Shack is coming back to Beechwood Community Centre for yet another night of fantastic live comedy. 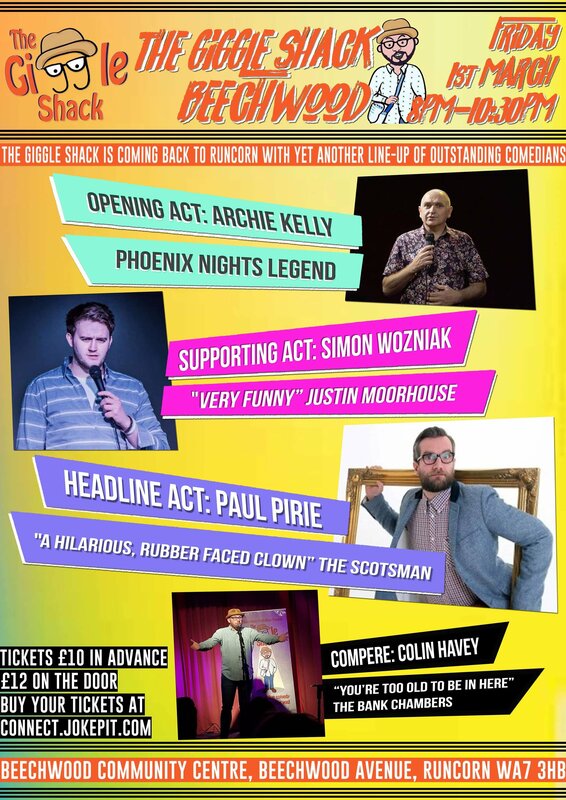 Opening the show is the fantastic Archie Kelly, star of iconic sitcom Phoenix Nights. Archie is one of the countries best loved acts and is always a real joy to watch. Our headliner is the amazing Paul Pirie. A hilarious, physical comedian who’s been dubbed “The British Robin Williams”. He’s a brilliant performer that leaves audiences gasping for breath. Support comes from one of the most exciting new acts in the UK, the brilliant Simon Wozniak who despite having only started comedy in 2014, is already performing at the biggest clubs in the country. Entry is not guaranteed on the night, the only way to ensure entrance is by purchasing a ticket in advance. Tickets will be emailed to you, please display them upon arrival.